What? That’s Kirstie Alley on the left? If you say so. Kirstie started her TV career as Rebecca Howe on Cheers, replacing the lacklustre Shelley Long and exchanging quasi-sexual banter with bartender Ted Danson (Sam). Kirstie won both an Emmy and a Golden Globe Award for her performance. In 1989 Kirstie starred in the big screen blockbuster Look Who’s Talking with John Travolta and Bruce Willis. She followed up with two dull, stupid sequels. For her contributions to the motion picture industry Kirstie was awarded her own star on the Hollywood Walk of Fame. That’s when her career took a nosedive. She was offered no further tv sitcom roles or lucrative box office roles. In 2008 Kirstie became the spokesperson for Jenny Craig and alleged she lost 75 pounds before Jenny fired her for re-gaining the weight and attributing much of her weight loss to Scientology. Oh, Kirstie. To read the article click here. In 2006 Kirstie made a huge career blooper by appearing in a bikini on the Oprah Winfrey Show and audience reception was less than enthusiastic. Dave Letterman replayed the clip while mocking Kirstie’s appearance. Ever the good sport, Kirstie made a 2010 appearance on the Dave Letterman Show discussing her Oprah appearance and her weight issues. To see Kirstie Alley’s Bikini Shock on Dave Letterman click here. To see David Letterman – Kirstie Alley: Eating and Tweeting. In 2010 Kirstie defended her bikini appearance on Larry King Live, much to his disgust. To see Kirstie Alley discusses her 2006 Appearance on The Oprah Winfrey Show in a Bikini.To see Kirstie in a Jenny Craig commercial click here. 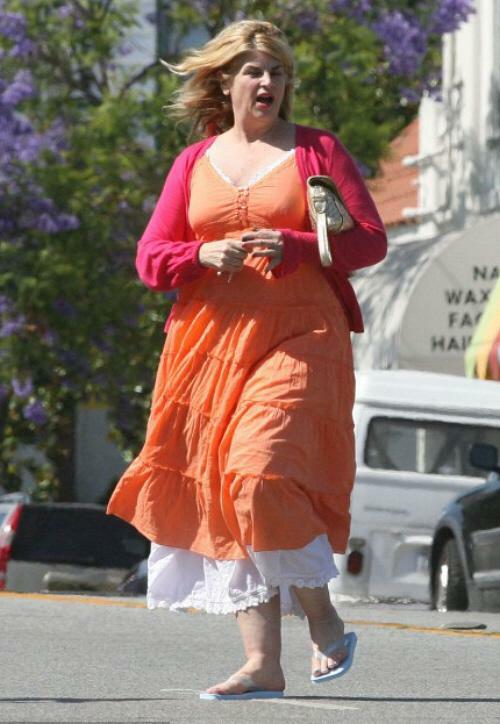 In 2010 Kirstie really bottomed out by starring in her own reality show, Kirstie Alley’s Big Life. Come onnn Kirstie! To see Kirstie Alley being dissed in The Dish: Kirstie Alley’s Big Life click here. The show is allmost as bad her latest career move on Dancing With the Stars. To see 60 Year Old Kirstie Alley on Dancing With the Stars click here. It took guts to appear on Oprah in a bikini. Comeback Grade: D for desperate to get back in the spotlight even if she has to humiliate herself to do it. To visit Kirstie’s Facebook Page click here. This entry was posted in Celebrities Who Bottomed Out. Bookmark the permalink. Yes, it’s easy to create a negative picture by simply omitting her successful work, isn’t it? I do like a nice bitchy article, but the posts on this blog are merely bitter and badly researched. Oh – learning to correctly size photos when putting them on a website might be a nice idea. Any eight-year-old should be able to teach you. WOW!!! Although there are many different opinion’s on what makes or breaks an actoress, I beleive that having (or not) weight is not one of them. Roles are filled by the upper echoloen in the business as they see fit. However, as Kirstie Alley has been gaining, loosing, gaining, loosing weight all of her life, this only leads to one conclusion: She is a REAL WOMAN!!!! I don’t know about you, but I was raised in the middle of the U.S. where woman actually EAT, work, have babies and of course their weight flucuate. Now that is a REAL WOMAN!!! Not these “starving” models and so called actress’s. By the way, where is your article on “too skinny” like Clarista Flockheart??!!!! If your going to diss on an actress, might as well be fairminded… Unless you just diss on actress’s your not attracted to??? Or you are GAY?? Talk to me about cunts like PARIS hILTON or Lindsay Lohan or Nancy Grace. Kirstie Allie is was 50+ years old when she started gaining, menopause expanded her. I’m confused as to what happened to her career after Cheers, as she was still hot. Not any more tho as she cant stop eating.